IPOs, M&A, Issuances | Kevin K. Boeh, Ph.D. 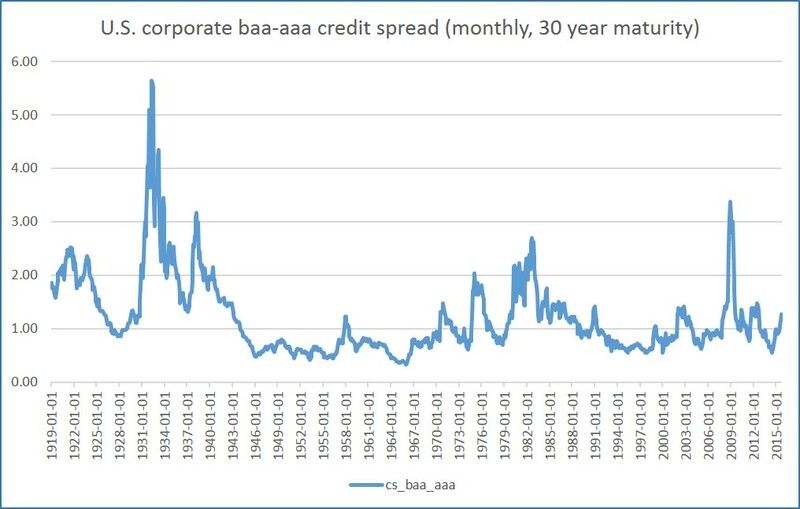 The graph shows the monthly U.S. corporate credit spread of Baa-rated bonds minus AAA-rated bonds. The bond yields are calculated as Moody’s seasoned corporate bond yields with maturities as close as possible to 30 years. Meaning? When the likelihood of default increases, the bond yield increases. Baa firms are more likely to default than AAA firms. 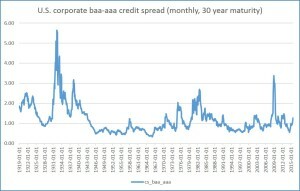 When good economic conditions are expected, investors expect both Baa and AAA firms not to default, and thus the credit spread is small. When poor economic conditions are expected, the likelihood of default of all firms increases, more so for Baa firms. As such, investors demand greater return (yield) and so we see the credit spread increase. A high spread generally indicates(expected) poor economic conditions. A data file is here. Despite going through the time-consuming IPO process, roughly 1 in 3 would-be issuers fails to complete its IPO and instead withdraws. Not all withdrawals are bad, and in fact some firms instead (e.g.) accept a buyout bid while others simply return to private status and raise no more money. In a paper with Dr. Craig Dunbar, we study the determinants of the success of firms that “fail” IPOs. Firms with venture capital backing or prestigious investment bankers are 24% and 8% (respectively) more likely to rebound from a failed IPO to conduct a private placement, merger/acquisition, or to re-file and complete an IPO. As well, firms with more underwriters on their IPO and with more revenue obtain better valuations in those post-withdrawal events. The former occurs because the underwriters compete to advise the withdrawn firm on its subsequent deal. Firms considering the IPO path and want a stronger fallback position should generally wait until revenues are strong, obtain venture capital backing, hire a prestigious investment bank, and ensure there are enough underwriters involved to foster a healthy competition for their business. Once gain, competition is good. This entry was posted in (Wh)Academia, IPOs, M&A, Issuances on January 16, 2014 by Kevin. Facebook (NASD: FB) issued its IPO at $38 and began trading May 18, 2012. Atypical of IPOs it immediately fell and then closed as low as $17.73 (53% loss) on September 4, 2012, remaining below its IPO price until August 2, 2013. On January 12, 2014 it closed at $57.94, a 52% gain. While many called this a botched IPO, the underwriters did well by the issuer by not leaving money “on the table” as happens when an IPO runs up after issuance. Was this a good investment for IPO investors? Since the issuance, FB has returned 52% while the S&P500 has returned 46%. On an annualized basis those returns are 29% and 26% respectively. So, FB wins, right? Hardly. Owners of FB have suffered extreme volatility — they woke up each day wondering whether they were richer or poorer. Investors dislike uncertainty, and so must typically be compensated for enduring it. Because FB has not been public long enough to reliably calculate a beta (a typical measure of relative uncertainty), we can instead compare the returns as adjusted by their respective standard deviations (Sharpe ratios from Nobel laureate, William F. Sharpe). The annualized standard deviation of FB and the S&P500 since the IPO have been around 54% and 12%. Using the annualized excess returns of FB and S&P500 plus the risk measure above, the Sharpe ratios have been 0.54 and 2.15 (higher is better). Holding the S&P500 was a far better risk-adjusted return investment for investors. This entry was posted in IPOs, M&A, Issuances, Uncategorized on January 13, 2014 by Kevin. Does your board of directors matter when conducting an IPO? In a research paper (pdf) published with Dr. Colette Southam, we study the governance structure of over 1600 IPOs to determine the effects on IPO failure. We find three interesting effects. First, when the CEO and Chair (of the board) are separated, a deal is 4% less likely to fail. Investors prefer the added oversight of having these roles separated. We also find two important board characteristics that a firm can change before the IPO. As it turns out, the size of the board does NOT affect whether the IPO is completed, but having experienced board members makes the firm less likely to fail. Investors in the market examine the governance structure and consider it when deciding whether to invest in an IPO. If you are considering an IPO, it pays to separate your CEO and Chair roles, and to build a board of seasoned executives…simply adding more board members does not matter. This entry was posted in IPOs, M&A, Issuances on January 13, 2014 by Kevin. Busy IPO bankers – Good or Bad idea? When a restaurant gets busy, your waiter covers more tables and you get less attention but perhaps the food is fresher given the high volume, right? Does the same hold for your IPO banker? In a research paper we are presenting in academic circles, Dr. Craig Dunbar and I study ~1700 IPOs and find that that IPO volumes do matter. When IPO markets are busy IPO price ranges are more likely to be adjusted across the board, but when a particular bank is busy it is no more likely to adjust the offering price. However, when busy banks do adjust the range, they adjust prices up (not down) just before the offering, and their IPOs tend to have a greater first day pop. That is, they leave more money on the table — good for investors, not so good for issuers. Two explanations come to mind. Perhaps busy bankers are too busy to adjust the price of their IPOs. Or, when a banker is juggling too many deals it sells them at a discount to reduce its pipeline? In the latter explanation, the issuer is competing with other issuers for the banker’s limited attention. Have you ever been seemingly “rushed” through a meal? Issuers should consider whether to choose an investment bank with too many other deals competing for attention span. This entry was posted in IPOs, M&A, Issuances on January 11, 2014 by Kevin. News that RBS plans to divest its RBS Citizens Financial group is an opportunity to discuss two interesting uses of the IPO. First, RBS has been unsuccessful in attracting a merger or buyout (M&A)_offer, and so instead they may sell to IPO investors. M&A offers come from sophisticated buyers (e.g., competitors) while IPOs attract investors from across the spectrum. Should investors be interested a deal that does not attract sophisticated buyers? Bear in mind that my commentary has nothing to do with RBS Citizens specifically, but rather this general category of IPOs. A second key use of the IPO is also at play. RBS is using the (threat of) IPO filing to better their negotiating position and to attract an M&A bid. Filing creates a real option — the option to exercise the IPO in lieu of a satisfactory M&A bid. This is known as “dual-tracking”, and research (e.g., Lian & Wang, 2007) shows that firms using the IPO option increase the acquisition premium by some 58%. When used and timed properly, dual tracking can be a very successful tactic. This entry was posted in Industry, IPOs, M&A, Issuances on January 10, 2014 by Kevin. After seven years at Microsoft (NASD: MSFT) my wife left last week for HP (NYSE: HPQ) and so I will finally discuss my thoughts! I am on record with hundreds of students in my classrooms predicting that Microsoft would buy Nokia and then “should” buy Sony (NYSE: SNE). That was two years ago. Isn’t Sony too big? Sony’s market cap in Jan 2014 is ~US$19B while Microsoft is ~US$300B. That is a very doable size. The Sony brand and the Sony consumer electronics design capability could help Microsoft engage the consumer and compete with Google and Apple. However, Microsoft waited…a long time…they bought (part of) Nokia after a several year precipitous decline in handset market share. Following the same playbook, Sony’s handset share has fallen and now we see Microsoft and Sony working on a Windows Phone deal. A major obstacle to an acquisition is that Playstation and Xbox own too much of the gaming console market. Why not spin off the Playstation group and buy the rest of Sony?…or again wait around long enough and we will see Steam, Nintendo, and perhaps the TV makers steal enough gaming market share that regulators will allow PS and Xbox to combine. Microsoft needs to make some bold moves in the consumer space, else leave it for good and focus on the business side. This entry was posted in Industry, IPOs, M&A, Issuances on January 9, 2014 by Kevin.